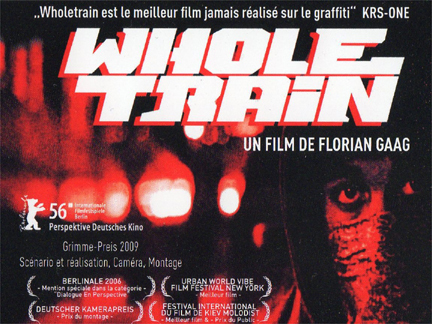 The award-winning graffiti film, "Wholetrain," is being released on DVD this Tuesday, so I managed to track down Florian Gaag, the writer/director, to get under the skin of the film, the film-making process and his next project. Stevio: You were a graffiti writer (Aero One) and have now written and directed an award-winning film and traveled the world. If we fast forward 5-10 years where do you think the KSB crew members will end up? FLORIAN: "Well, the story in the film leaves that open. All is possible, I´ve seen graffiti writers turn into sophisiticated fine artists, drug pushers, teachers, highly successful business men, drug addicts etc., so the whole spectrum of the human condition is reflected within this culture. 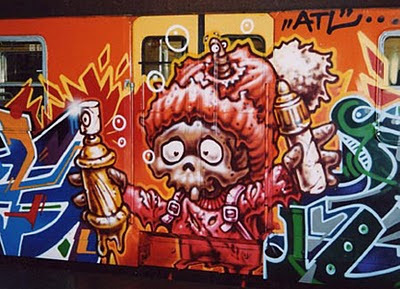 "Wholetrain" really focuses on that moment in the protagonists' lives where they´re just doing what they´re doing, totally devoted, without overly reflecting or intellectualizing it from a distanced point of view – a moment every writer who has been seriously involved with the (graffiti) culture can relate to. Of course people´s viewpoints change when they get older, they see the multi-dimensionality of this movement, things like promoting your name and getting up is probably less important. But to me..."Wholetrain" is about the essence, that´s where it all started. That´s the beauty." ATL piece from the film "Wholetrain"
Stevio: We have both gone back to school and have moved from Europe to live in the U.S. Do you think you could've made "Wholetrain" without film school? What did (film school in) New York give you that Germany/Europe could not? FLORIAN: "Could I have made "Wholetrain" without film school? Probably, yes. But I´m sure it would´ve been a lot harder – harder than it already was. I went to New York because so many things that have influenced me have their roots there. So being in New York, in the graffiti-mecca, and meeting people who have been central in the evolution of writing culture, certainly pushed me towards turning the idea of "Wholetrain" first into a screenplay and then the finished film." Stevio: What storylines did you want to develop, but had to drop for whatever reason and why? FLORIAN: "I basically wrote the screenplay and shot the film just the way i wanted to. I didn´t have to make adjustments for the producers or anybody else. I made that very clear in the first production meetings that i wouldn´t compromise in terms of making the movie more accessible by over-explaining the protagonists' wants and needs or adding certain elements to give it an appeal for a mainstream audience. I really wanted to focus on the crew and on the characters lives, without moralizing or judging what they´re doing. I had to drop one part of a scene, though, for budgetary reasons. In that scene the protagonists – all boozed up and smoked out – would´ve ran into Dr. Funkenstein himself and helped him to get the Mothership back into the air...And I have no idea if I could have pulled it off, but my funk-infested brain couldn´t help but coming up with the idea." Stevio: People compare your film to "Wild Style" and "Style Wars" for obvious reasons. How conscious were you about following in their footsteps? What other films were most influential to you during the film making process? FLORIAN: "These two iconic films were of course highly influential for me – as for all European first generation writers. They really made us understand the scope of this culture with all its elements. 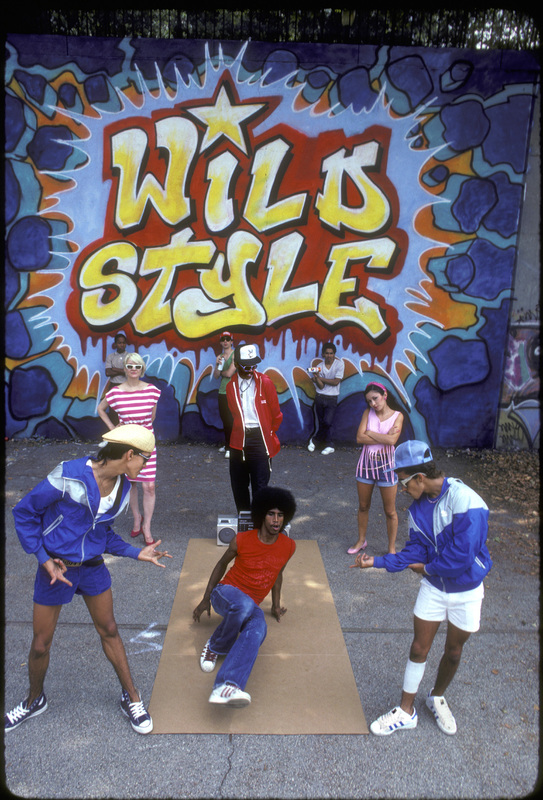 I was scribbling on public walls before, but when i first saw "Wild Style" and "Style Wars" it all made sense. 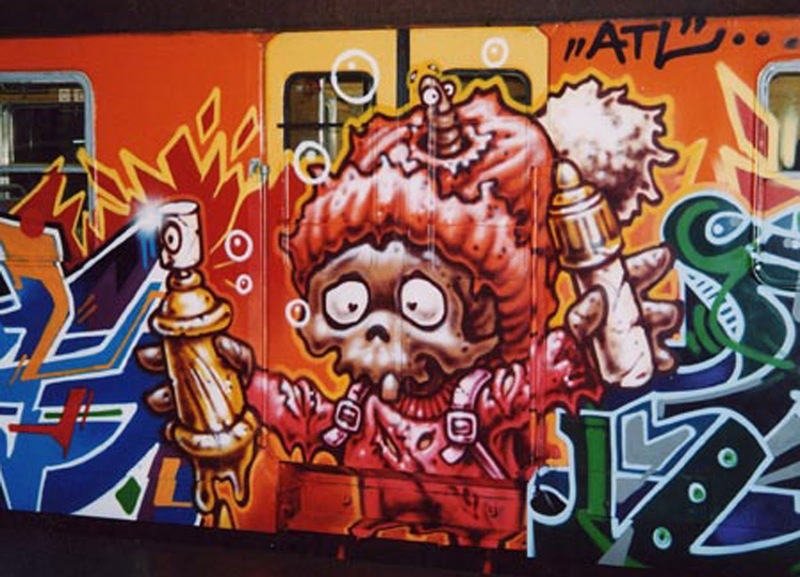 When doing "Wholetrain" it wasn´t really about following in the footsteps of these films, "Style Wars" is a documentary, "Wild Style" a docudrama. "Wholetrain," however, is a fictional feature film with actors (or self-taught actors), so the whole approach was very different. There weren´t a lot of films that i could use as a reference. "Kids" by Larry Clark was definitely an important one. "La Haine" by Mathieu Kassovitz, although the cinematic style is very different. And there´s a French director by the name of Siegfried whose work i really like. But in general my film taste is very eclectic and i appreciate the work of many different directors from all over the world." Stevio: You wrote and directed "Wholetrain," but what partnerships were vital to enabling you to make it happen? FLORIAN: "Actually, I was also the co-producer and in many instances the main producer, especially in putting all the different parts together and making them work. I had production partners who I worked with to secure the funding and shooting permission – an odyssey of about two or three years, since no one wanted to invest in a movie with such a controversial subject. And the German transportation company refused to collaborate and threatened to inform all other transportation companies in Europe so the project would be blocked. I already had access to the graffiti community. I started writing in 1984 and was actively doing it up until the early nineties, so I already knew most of the guys I worked with from back in the days. The artists who I collaborated with on the soundtrack I didn´t know personally, so I just linked up with them, met them after a show, contacted them online or through people who were close to them and then sent them my beats, clips from the film and rough ideas what I wanted them to express in the lyrics. The most important partnership however was the comissioning editor at the German TV station ZDF who was the first guy to believe in the project and, thus, paved the way for others to follow. (Nice coincidence: this is the same editorial department that funded "Wild Style.")" Stevio: To all those folks who are tempted to watch pirated versions of "Wholetrain" instead of buying a copy can you give an outline of how much time you invested in this project? FLORIAN: "I started working on "Wholetrain" 2002, so about 10 years ago and I´m still working on it! The process of financing, getting shooting permission, pre-production, the shoot, post-production and dealing with the promotion, distribution, finding foreign partners etc. took about six or seven years. Not very lucrative if you look at it from a commercial point of view. But it was never about the money for me. It was all about making the movie I wanted to make and giving something back to the culture that has given me so much. I hope I succeeded." Stevio: How did you manage to make the film and also produce the sound track album? FLORIAN: "That was pretty difficult at times. At the last minute, the production company refused to support the production of the soundtrack, in contradiction to their earlier statements, so I was forced to finance it myself. Coming up with the money during post-production and at the same time mixing the film, finishing the beats, hooking up with the artists, organizing the sessions and recording the tracks put me under a lot of pressure. But I´m really glad it all worked out and we could finish the film on time for the premiere at the Berlin Film Festival. I then released the album on my own label Stayin´ Up." Stevio: I asked Charlie Ahearn once why he created the "Wild Style" white label records for most of the party scenes instead of using the classic break beats and rap tunes. He said that the licensing fees were too high for his budget, but also for control and continuity since the hottest rap tunes favored by the rappers changed on a weekly basis. What were you reasons for creating a soundtrack to the film? FLORIAN: "Licensing fees were definitely a reason. But, more than that I wanted to create a unique soundtrack with exclusive graffiti-themed tracks. And I wanted to work with people whose music I dig and who have either been active as writers themselves or have love for the culture, guys like Tame One and El Da Sensei (Artifact), KRS-One, Planet Asia, Afu-Ra. It was a great moment for me when KRS-One presented "Wholetrain" at S.O.B.´s in New York. I bought "Criminal Minded" right when it came out in 1987 (when they had tiny crates with hip hop-vinyls in stores, direct import records) and was spinning it forever. So seeing him embracing the film was really cool." Stevio: What advice do you have to other (hip hop) storytellers who want to get into film making? Do you have a Top 5? FLORIAN: "I have a Top 3: Be persistent, be patient, and most importantly: Don´t fake the funk!" Stevio: What is your next project? Have you received any interesting offers since "Wholetrain" hit the screens? FLORIAN: "You know how it is sometimes when you make a film in a certain genre or about a certain scene or culture. They want you to reproduce that same film over and over. So i got many offers doing films about other so called youth cultures or urban, subcultural movements. But I hate to repeat myself so I wrote a new screenplay and will be doing a very different film next year. More like a thriller / horror-drama."